The team uniform represents more than what some fans may think. Jerseys are often historic symbols that represent the cities that they belong to, and some are even deeply rooted in the lengthy, rich history of the NHL. This list will examine the top-10 nicest current NHL jerseys, and will include only home and away jerseys (so no Stadium Series, alternate or other special occasion jerseys). The vast majority of NHL jerseys are nice, so deciding on only ten was tough. Some jerseys on this list are important to their city heritage, while others are just plain awesome. Honourable mentions go out to the rest of the NHL teams, but more particularly to one of my personal favourites, the Nashville Predators. 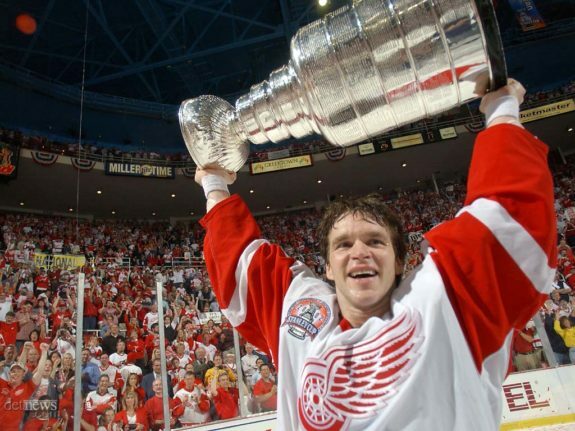 Luc Robitaille, 36 at the time of this photo, won the Stanley Cup for the first time with the Red Wings in 2002. The Wings’ uniforms reflect their success and notability amongst NHL teams and have done so since the early 1930’s. As the old saying goes, “if it ain’t broke, don’t fix it.” This is absolutely the case with this jersey that has withstood the test of time in the NHL. The “Broadway Blue” Rangers jersey is one of a few classics found on the list. A jersey donned by greats such as Wayne Gretzky, Mark Messier and Jaromir Jagr (among many others), the Rangers jersey represents New York very nicely. The glam of the city and its character are nicely conveyed on the Rangers’ uniform. 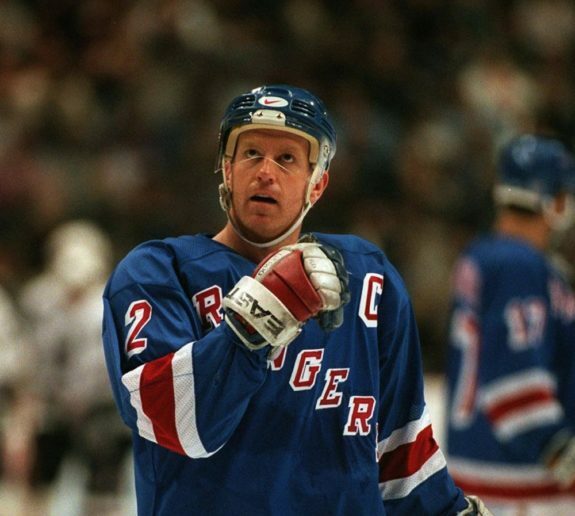 New York Rangers’ former captain Brian Leetch sporting a jersey that has stayed fairly consistent throughout team history. The Rangers’ uniforms are able to capture so many aspects of the city and country that they represent. The red, white and blue colour scheme nicely pays tribute to the United States, while a little bit of Broadway flashiness depicts New York nicely. The reincarnation of the Jets came with the revival of a hockey-driven city, the youth movement of a franchise, and the introduction of swanky new uniforms. The Jets wanted to commemorate their rich history in Winnipeg, their original move to Phoenix (now Arizona) and their Canadian heritage in their new uniforms, and they did. 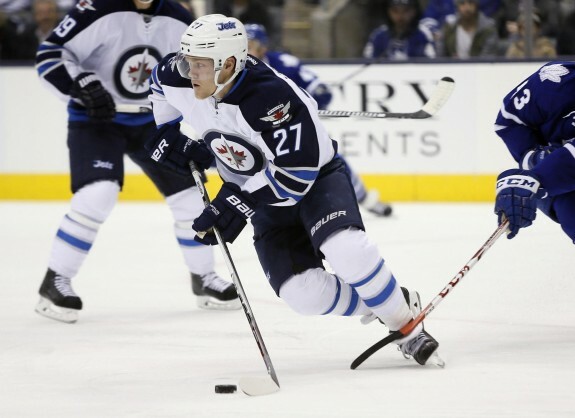 Nikolaj Ehlers showing off the Jets’ revamped, restyled uniform in a game against the Toronto Maple Leafs. The revamped Jets jerseys use the same colour pattern as the originals, but the logo has changed drastically. The logo pays tribute to the Royal Canadian Air Force — but more particularly to the 17th Wing, which is the Canadian Air Force base in Winnipeg. The uniforms nicely represent the second coming of a very important Canadian organization. Like the other Original Six teams on this list, the Leafs’ jersey comes with a tremendous amount of history and prestige. The team uniform hasn’t changed much throughout the league’s timeline, and it is considered a league classic. The Leafs will start next season with a slightly changed logo that pays tribute to their team history. Toronto’s team very clearly represents their country in name and in uniform. The Leafs’s historic organization hopes that with their new logo comes some new success for the team. 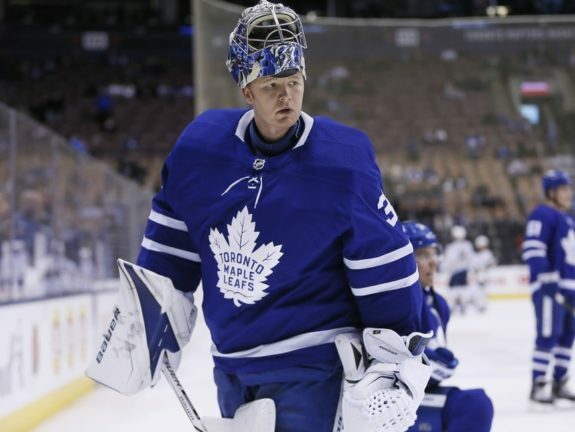 They’re one of the league’s youngest teams, and they’ll look to add a few new pages to the illustrious Maple Leafs history books in the near future. As this list proves, sticking with classics is often a recipe for success. This is why the Kings received some heat for changing up their jerseys from the classic ones that were worn in their earlier days in the league. However, if you’re gonna make a change, make it worth it — and the team did just that. 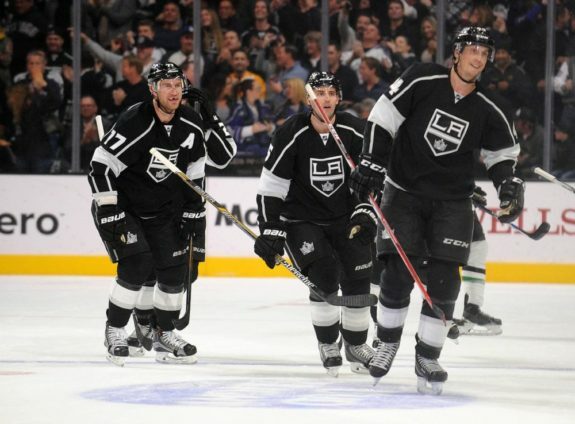 The restyled Kings jerseys are snazzy, stylish, and they represent the spirit of the city nicely. The Kings’ jerseys have switched multiple times throughout team history, but the updated ones may be here to stay. Some more traditional fans may still be opposed to the revamped look, but the uniforms depict the fame and story of the Los Angeles area perfectly, and let’s face it, they’re pretty cool. The Flames’ jerseys pay tribute to the team that preceded them, the Atlanta Flames. 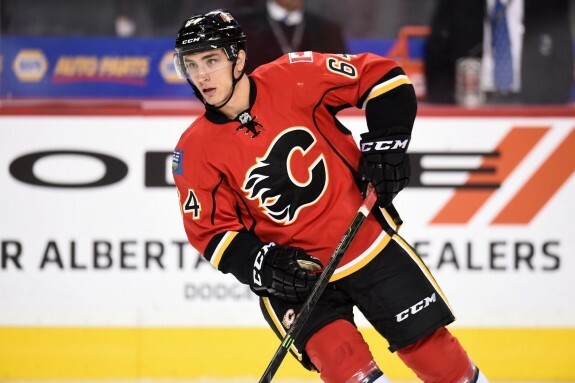 There isn’t a strong connection to Calgary in the uniform, but the aesthetics make up for it. The Flames have a fairly easy colour scheme to work with, and because of this, there was no going wrong on their jerseys. The team has connected their uniform to Calgary by creating rodeo inspired alternate logos. Though this jersey isn’t as deeply rooted in the history of a city, it’s still very nice. A cool colour scheme and nice execution on the uniforms, the Flames’ jerseys rank themselves very respectably on the list. The Blackhawks jersey has undergone very few changes since the mid-1950’s. 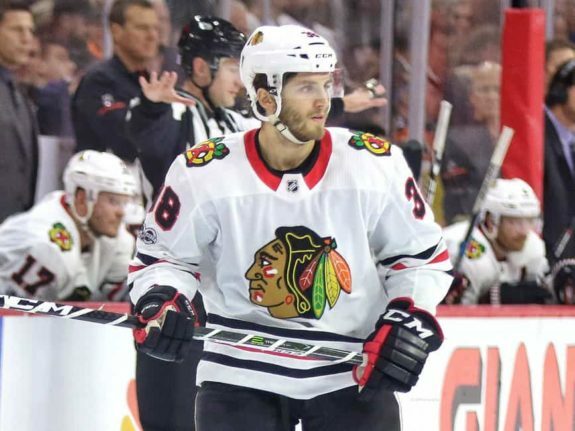 While the jersey is an NHL staple, the team logo has received some backlash over the years as it had been deemed culturally insensitive by some. The logo’s origins stem from team founder’s division of the U.S. Army. Some still wish for a more politically correct logo. With this aside, the Hawks uniforms are extremely sharp and still merit a spot on the list. The ‘old school’ style makes the jersey one of the league’s nicest. Some wonder whether a change is coming to the Chicago logo. Sticking strictly on the ice, though, the recent success of the organization cannot go unnoticed. The team has been the closest thing to a dynasty that the NHL has seen in the last little while, winning the cup in three of the last six seasons. 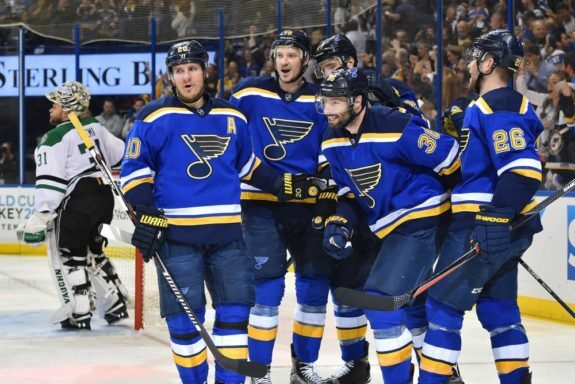 Other than having an awesome design and colour scheme, the Blues’ uniform represents St. Louis’ history. The team logo is a blue musical note, which commemorates the musical spirit of the town. The logo has been the same for a while, but the jersey has changed over the years. Luckily for Blues fans, it has evolved into one of the league’s nicest jerseys. The Blues are the oldest team in the league to have never won a Stanley Cup, though they hope that this year will be their year. If it’s not, though, let’s look at the positives: they still have pretty sweet threads. The Bruins were named by their original owner, Charles Adams, who wanted the team to be powerful and feared. In Adams’ vision, the team built a reputation to match their name. 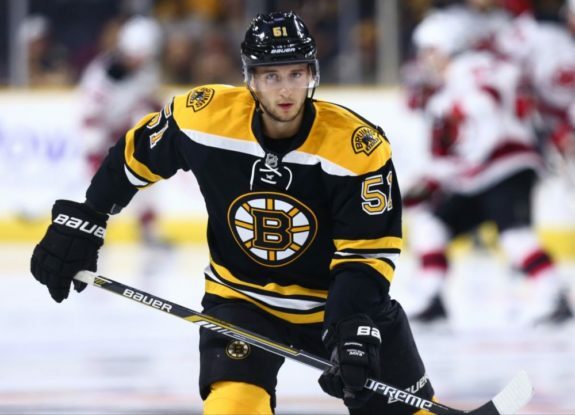 The ‘big bad Bruins’ have been one of the most physically dominant teams in NHL history, and their powerful uniform colours and team name match that perfectly. Like some of the other original six teams on this list, the Bruins’ logo hasn’t significantly changed over the years. Yet another classic on the list, these uniforms are synonymous with the hard-hitting hockey that has made the team so successful since the start of the NHL. The Habs’ jersey is the most historic in the league; the uniform has stayed pretty much the same since the early 1910’s. The jersey has been one of the few consistent things throughout the incredible team history. Like many others on this list, the Habs’ design and jersey have withstood the test of time. Unlike other uniforms on this list, though, this one has become a part of Montreal culture. The CH, a fairly simple design, has become one of the most iconic logos in sports today. 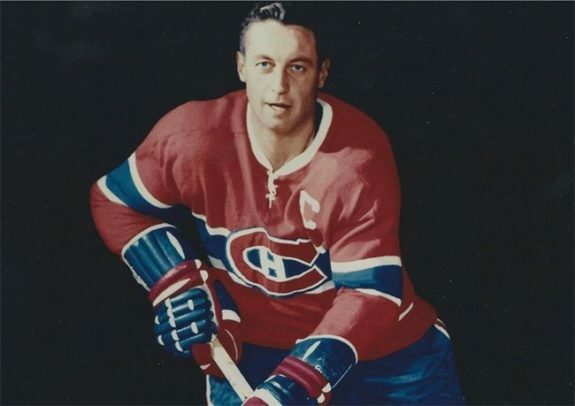 Jean Beliveau was one of the most (if not the most) unanimously beloved athletic figures in Canadian sports history. He, along with the many other iconic Habs’ alumni, helped make the bleu-blanc-rouge what it is today. History aside, the Habs’ jersey still merits the #1 spot on the list. The image above shows the jersey that was recently re-adopted by the team. The Habs paid testament to their past by adding the lace and white collar to their classic jersey to give it the ‘vintage’ feel, which many fans love. The jersey is also referred to as “La Sainte-Flanelle” which translates to “the holy flannel” or “the holy sweater.” The Montreal Canadiens’ jersey is the league’s nicest because of its history, its design and its meaning to Montreal.